Tim’s radio career began at WQFS in Greensboro, N.C., when he was a college student. But Tim’s interest in Americana music goes back even further. While in high school, he took part in a three-week folklore field trip, visiting and recording artists like John McCutcheon, Rich Kirby, and Si Kahn, and visiting the Carter Family’s homestead. High school was also when he began listening to musicians like Jerry Jeff Walker, Ry Cooder, and Merle Haggard, along with groups like The Allman Brothers, Lynyrd Skynyrd, and the Charlie Daniels Band. 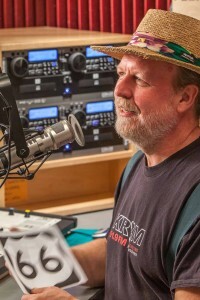 After moving to Eugene and beginning a family, Tim found KRVM on his radio dial and became a regular listener, especially to a show aired back in the ’90s called The Fat Music Show. He decided to get back into radio when the opportunity to host KRVM’s Routes & Branches became available, and he’s hosted the show since 2008. Tim continues to be inspired by new music and the many musicians that he gets to meet along his musical journey. Tim is owner of Built To Last Woodworking, and says KRVM has long been the only station he listens to while working in his shop.